The University of Toledo finished No. 1 in the Mid-American Conference in home football attendance for the second consecutive season with an average of 21,352 fans per game in 2018, well above the MAC average of 15,532. The Rockets totaled 149,462 fans in seven home games. The season-high mark was 28,117 vs. Miami (Fla.) Sept. 15. The Rockets averaged more than 21,000 fans per game in 2018; this included a capacity crowd of 28,117 vs. Miami (Fla.) Sept. 15. Seating capacity for the Glass Bowl is 26,038. Toledo averaged 20,745 fans in 2017, also tops in the MAC. The Rockets also sold 11,830 season tickets in 2018, a 13.8 percent increase from the 10,388 season tickets sold in 2017. 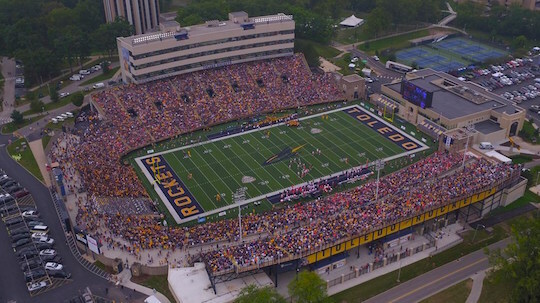 Toledo’s 2019 schedule will feature six home games, including a Sept. 28 matchup with Brigham Young University. The Rockets also will host Northern Illinois and Western Michigan among their four conference home games. This entry was posted on Tuesday, December 4th, 2018 at 4:12 am and is filed under Alumni, Athletics, News .